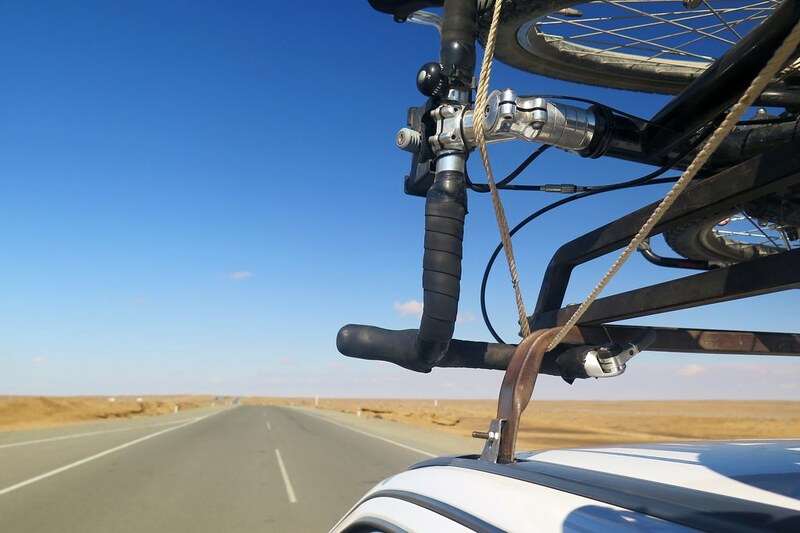 For this second leg in Uzbekistan, we didn’t spend much time on the bikes. Most of the kilometers were covered in taxis or on the train. Hence this post isn’t a particularly long one! 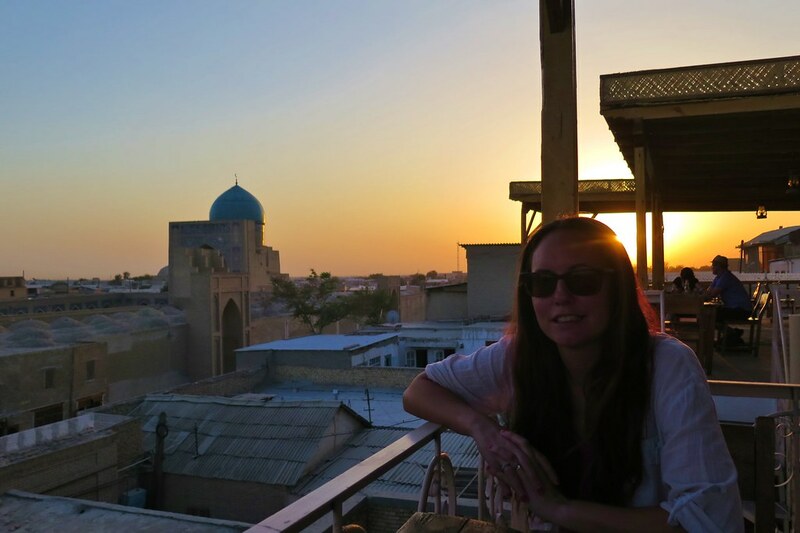 The first thing we did after arriving in Bukhara was go for a traditional hamam bath. A sauna, a brutal massage and a skin searing ginger body scrub actually felt pretty good after a few days riding through the desert. 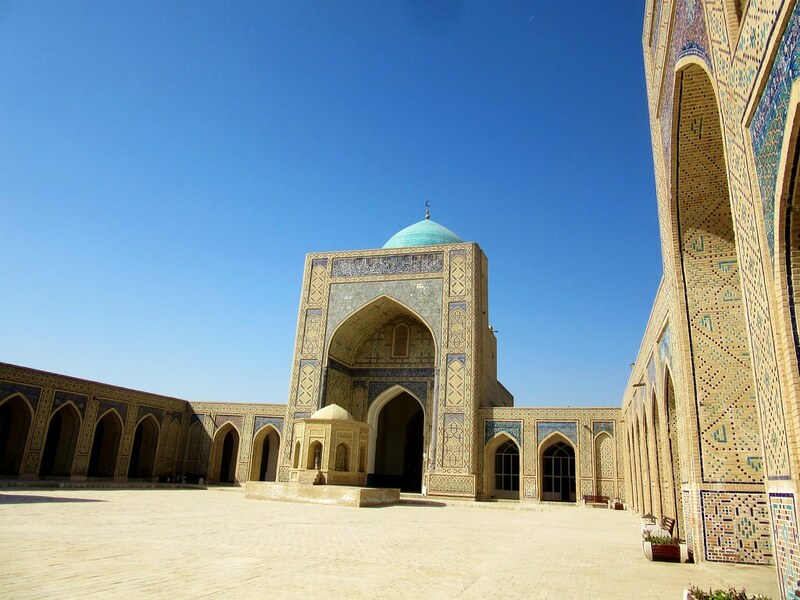 The rest of our time there was spent wandering round the sights, lots more blue tiled madrassas and mosques, similar to Samarkand but a little less touristy and ‘Disneyfied’. 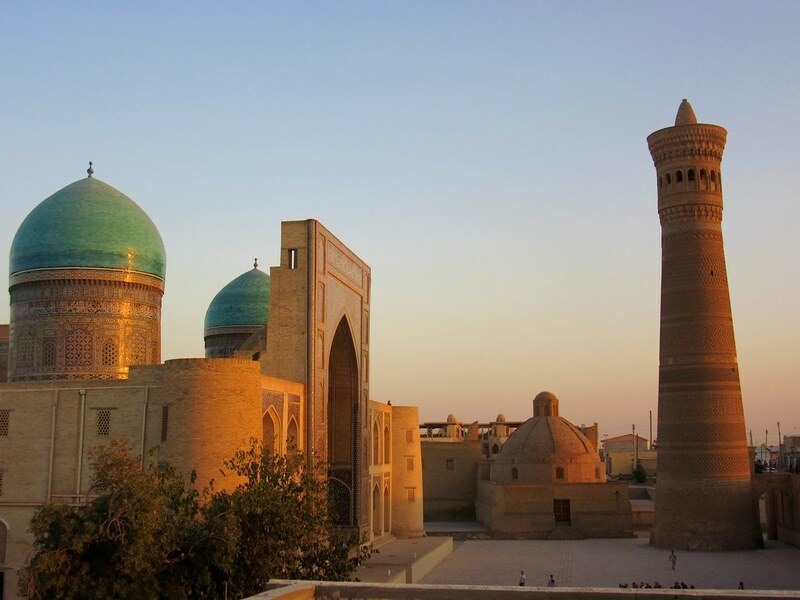 Then from Bukhara we took another taxi with our bikes which took us up to Khiva. The desert we drove through didn’t make us regret the decision. The taxi dropped us just outside the gates of the old walled city, so at least we could ride into town, pretending we were cycle tourers! 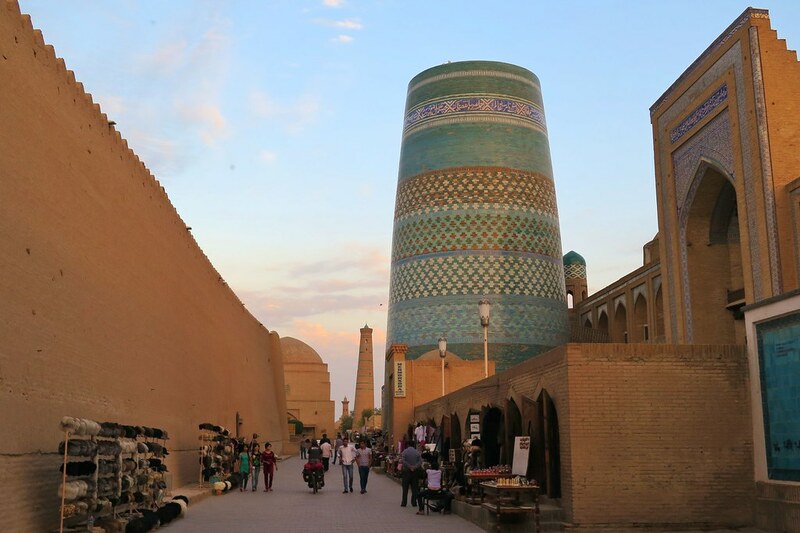 We spent another few days off the bikes in Khiva, doing more of the same. 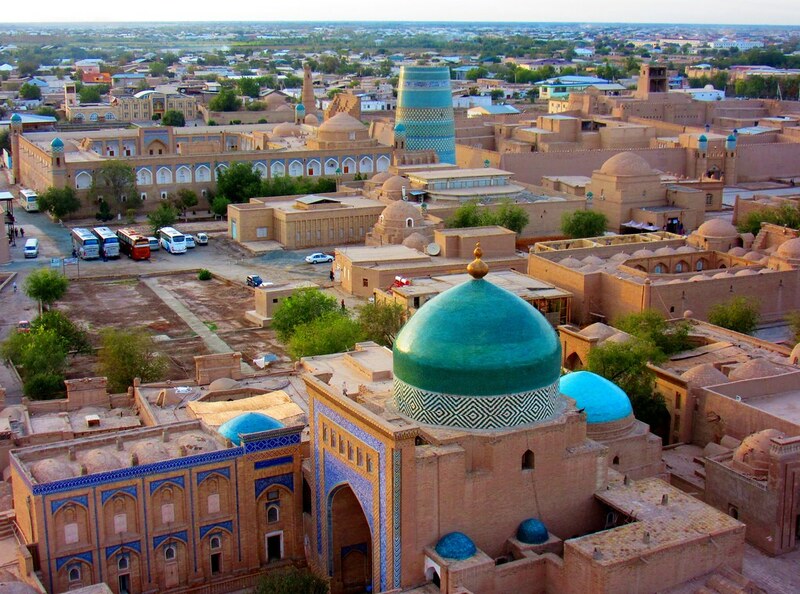 Khiva is smaller than Bukhara and Samarkand and the old town is enclosed by a big city wall. 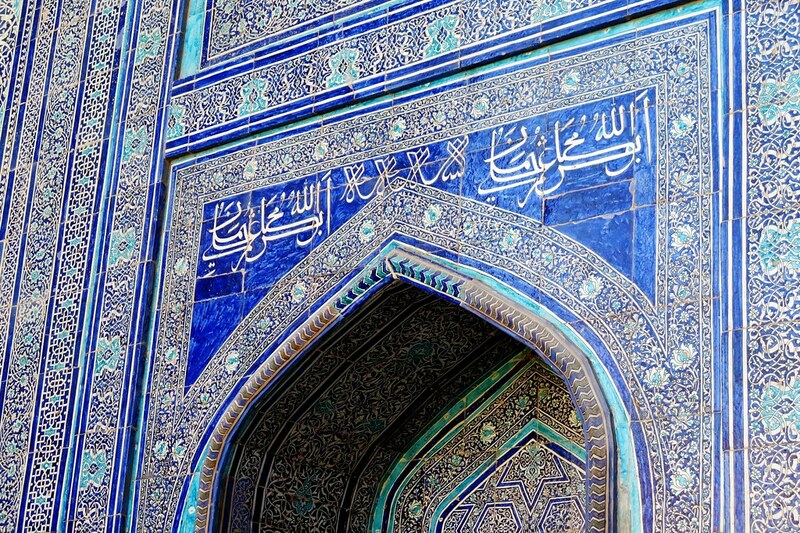 Although beautiful, everything inside the wall was again very touristy and quite expensive. Maybe we were just getting jaded by everything having an entry fee, or even an extra charge to take photos! 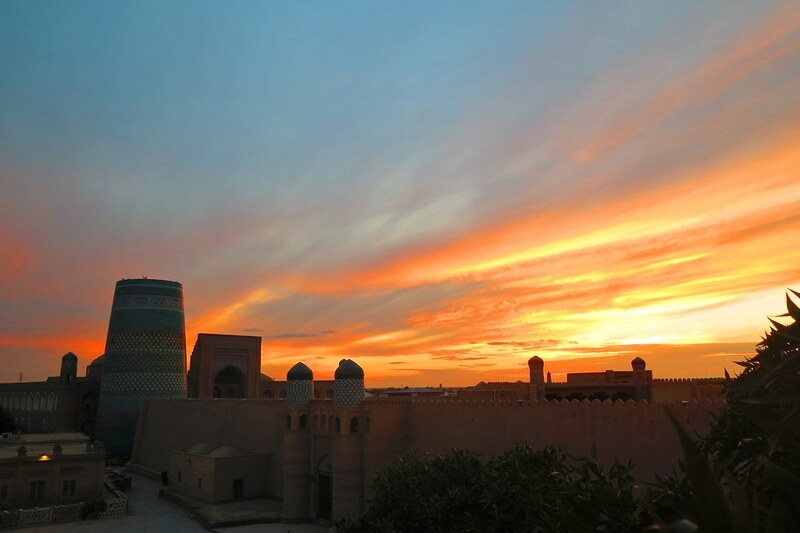 Some things were worth it though, like going up the tallest minaret and then catching an amazing sunset over the city walls. We met up once again with Tim and Claire, and went exploring outside the walls to find some good places to eat and drink in the evenings. 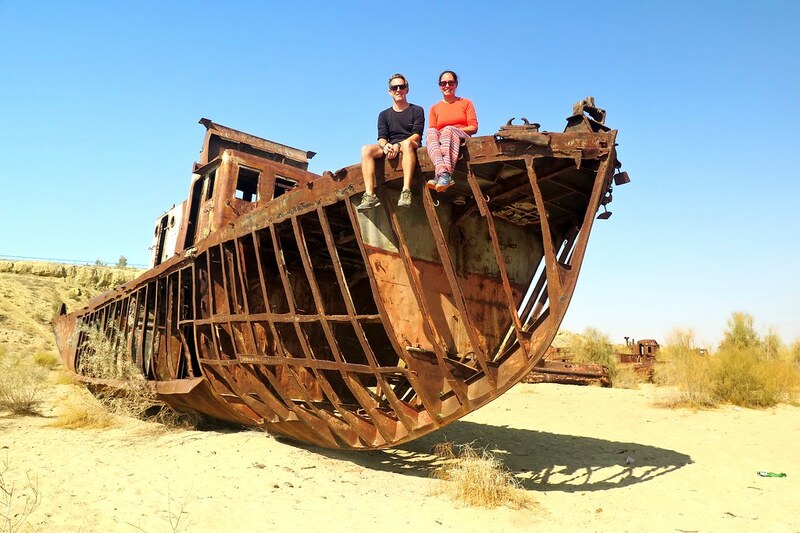 From Khiva, Tim and Claire headed back down south to cross through Turkmenistan into Iran. We continued north to Kungrad, again by taxi. 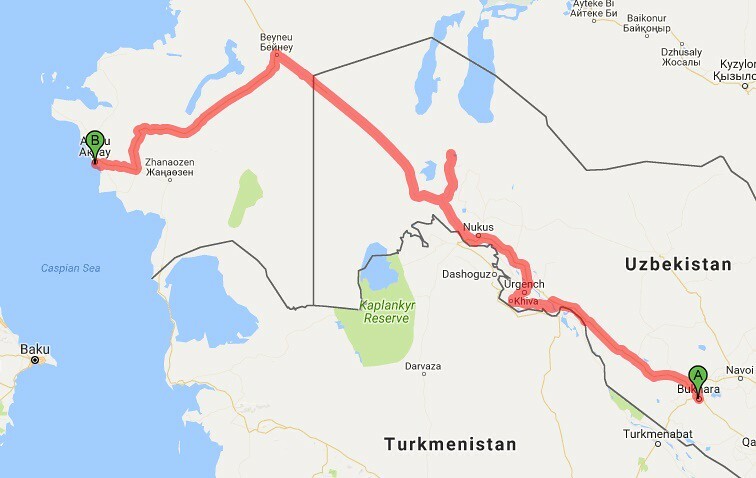 100km north of Kungrad is the town of Moynaq. 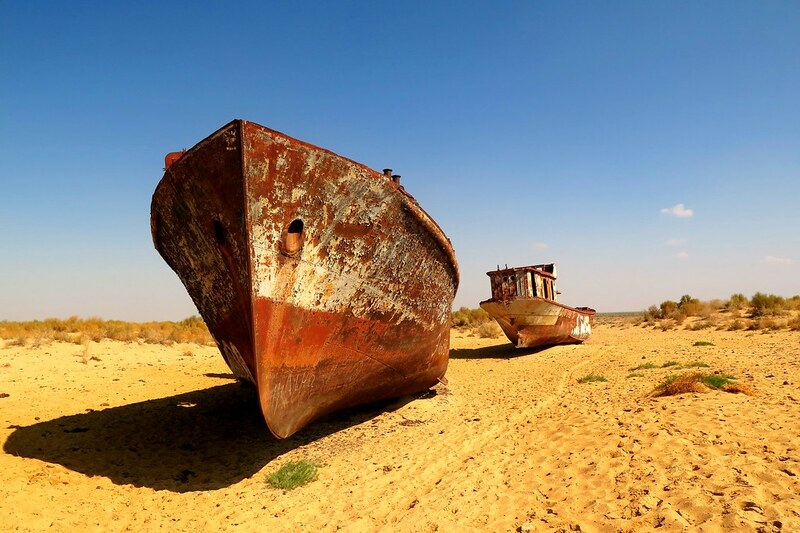 In the 1960s and 70s, Moynaq was a booming fishing town on the Aral Sea. Since then, the rivers that fed the Aral were diverted to irrigate the cotton fields, causing the sea to shrink and virtually disappear. 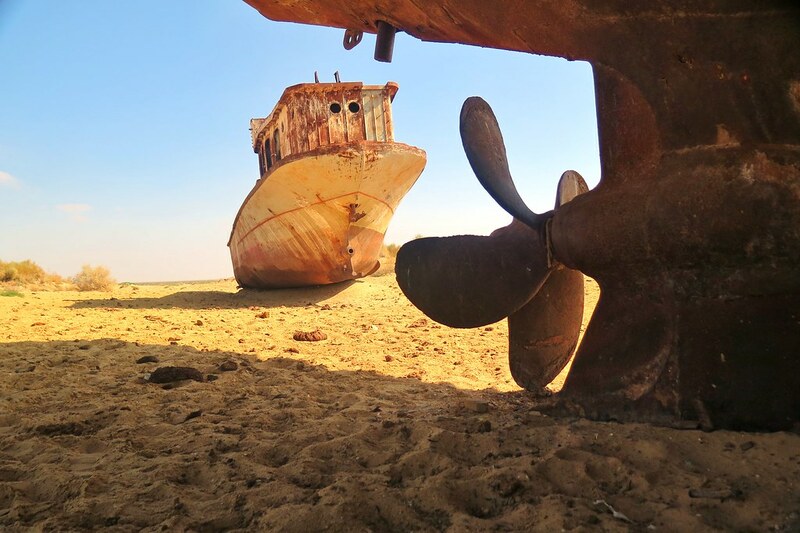 We travelled up to look at the remains of the fishing fleet which was left rusting in the middle of the desert, many miles from the nearest water. 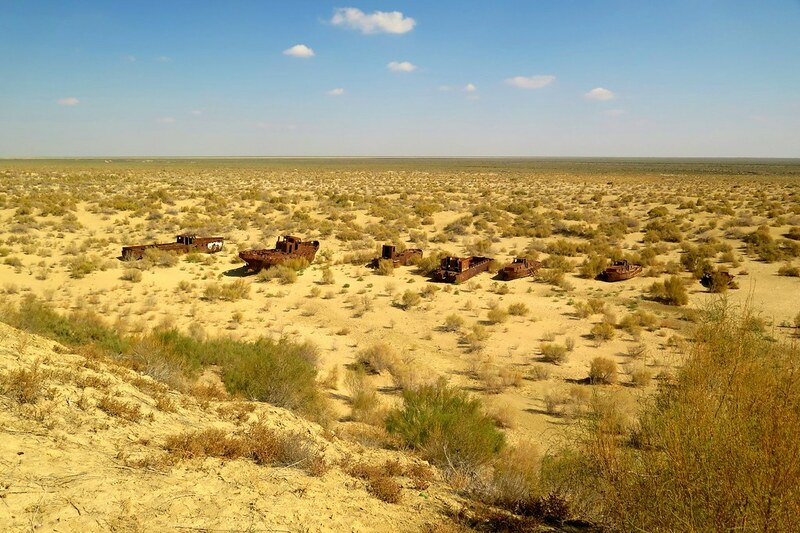 For the final stretch from Kungrad to Aktau in Kazakhstan, we took a train. 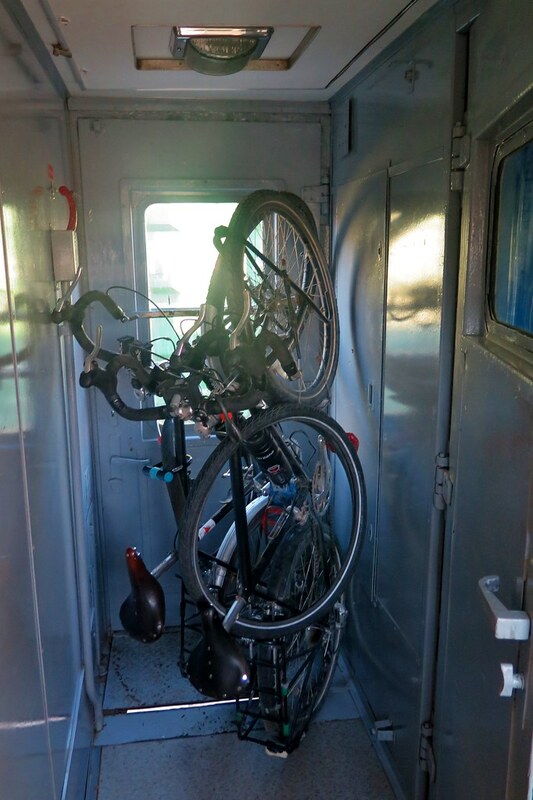 Loading the bikes into the carriage was a bit of a pain as the guards weren’t particularly enthusiastic about letting us on with them! Eventually we jammed them into a doorway and settled in for the ride across the border. 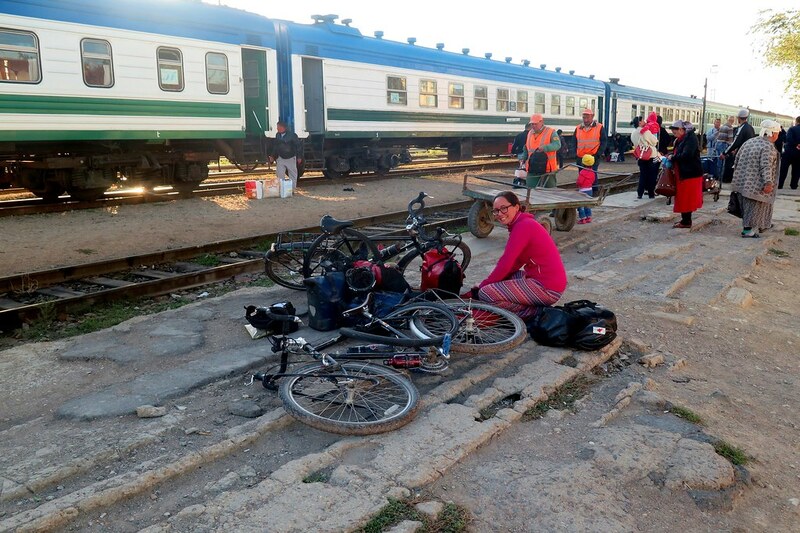 Luckily as we had a ticket all the way to Aktau, we didn’t need to get off the train for the border crossing. 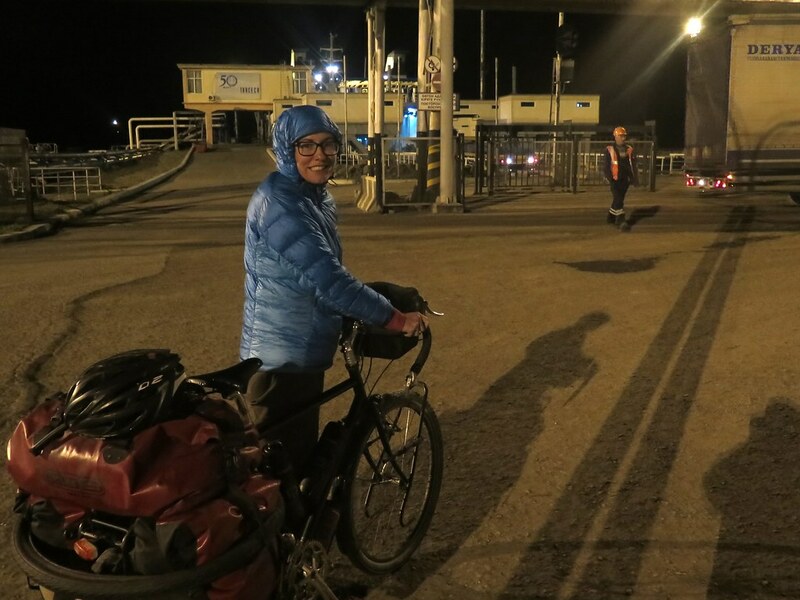 Unlike entering the country, our panniers only got a token check by customs and our passports were checked and stamped fairly quickly. 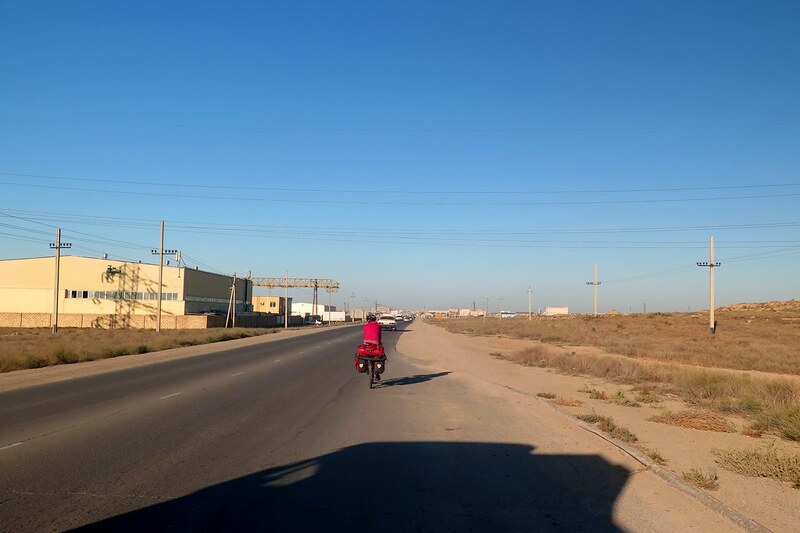 Early the next morning we arrived at Aktau, or more accurately, 20km outside Aktau. For a change, we actually rode our bikes to get into town. Aktau doesn’t have a great reputation, but arriving from the East, it felt very developed and modern! 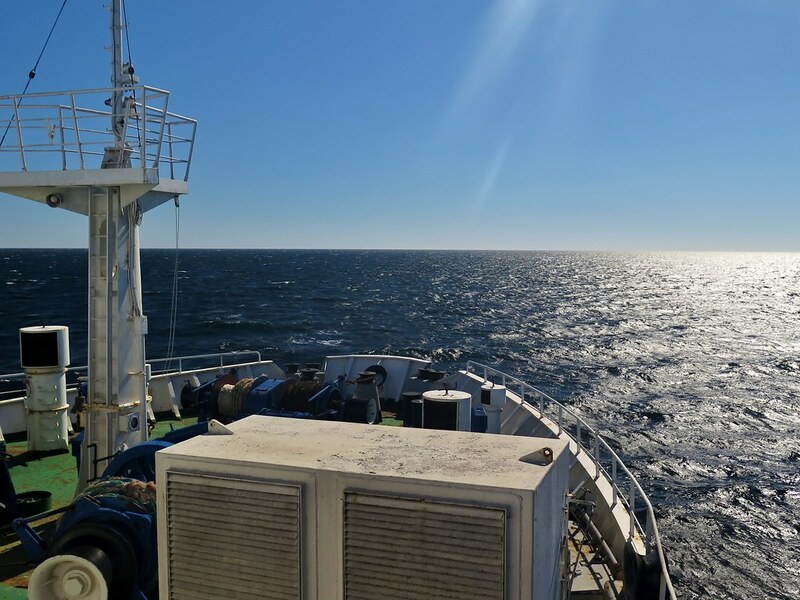 It helped that the sun was shining and the Caspian Sea looked lovely and blue. We went straight to the ferry ticket office to try and get booked on to one of the boats crossing over to Baku in Azerbaijan. We were told we’d missed one by 30 mintes and to come back the next day. And then the next day we were told the same. 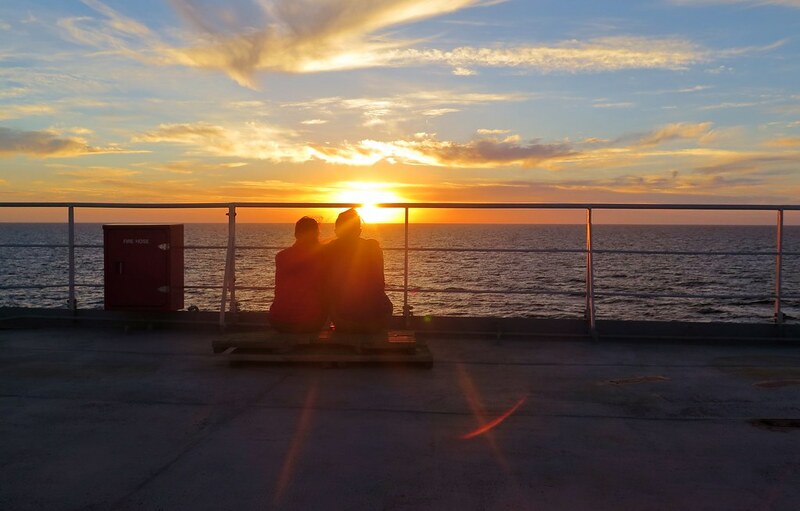 It was alright though, Aktau had enough to keep us entertained for a couple of days and we found a nice cheap hotel with a great hot shower and western world speed wifi so we were happy to hang around. Returning to the ticket office on the third day, we were able to buy a ticket and were told to be at the port at 11 o’clock that evening. Once we were down there, the boat was nowhere to be seen. It arrived at about 2am, and then was unloading until 5 so we had a long wait with the truckers. One of the port workers took pity on us and invited us into his office for some tea, so we weren’t out in the cold for too long. Eventually we were able to get onboard and into a cabin to get some sleep. The boat finally left sometime after 7:30 the next morning. Azerbaijan next. We’ll do more cycling there, definitely.